I really, really love stuffing and gravy. So much so that I’d be perfectly content with making and consuming only these two dishes on Thanksgiving. Adding a generous dusting of dried rubbed sage during the cooking times here creates an amazing aroma once it hits the heat, and yields a rich and earthy flavor in each savory bite. 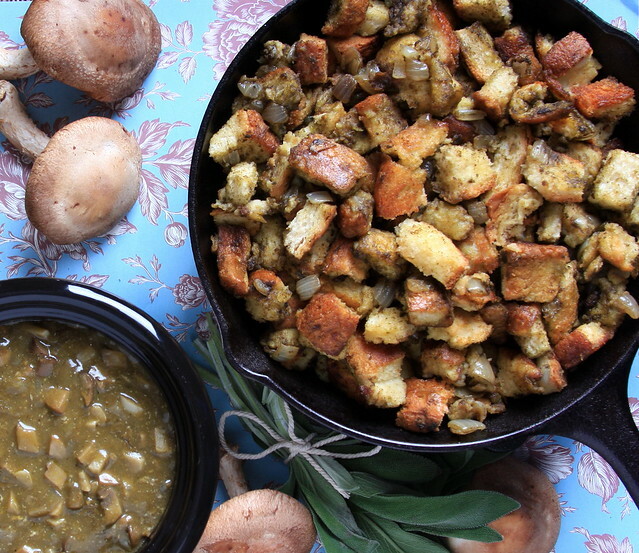 I drench every inch of the stuffing I can with vegan butter and broth to produce a decadent and doughy stuffing, which pairs perfectly with this mushroom-packed and wine-kissed gravy. Year after year for Thanksgiving, I make these two dishes without really paying attention to measurements. So when I decided to put them on the blog this year, it was a bit of a challenge to replicate them, simply because I had to stop and record each step with a timer and/or measuring device while I was making it, instead of just eyeballing, guessing and going by instinct—so the ingredients and method below are more of a guide than a recipe set in stone. Heat the Earth Balance over medium heat in a medium-sized saucepan. Add in the shallots and saute for a minute or two. Add in the garlic and saute for a minute more. Add in the salt and pepper, then 1 tsp of the dried sage. Stir well to combine. Add in the mushrooms and stir to coat. Saute for 2 minutes, then add in the tablespoon of olive oil and remaining 1 tsp of the dried sage. Allow to saute for 5-6 minutes, then increase the heat to high. Once it starts to sizzle, add in the white wine to deglaze the pan and allow to simmer for an additional minute or two. Now, add in the broth, bring to a simmer, then lower the heat to low and allow to simmer for about 20 minutes, stirring occasionally. Add in the arrowroot/cold water mixture, and stir until slightly thickened. Remove from the heat and add in the nooch, if desired. Transfer immediately to a small crockpot and set to warm. Serve directly from the crockpot during dinner. A note about the stuffing: I drizzle the stuffing with as much vegan butter as I can. In fact, I make sure that every single piece is coated with it, then drizzled and replenished with rich broth at a few intervals throughout the cooking time. If this isn’t your thing, just cut back on the ratios and you’ll still have a fabulous-tasting stuffing! If you don’t have enough oven space or want to simplify your cooking to-do list on Thanksgiving day, you can also just throw the stuffing into a crockpot for 4-6 hours. Just use a shallow, wide crockpot instead of the thin, high kind, so the stuffing doesn’t get squashed during cooking time. Preheat your oven to 350. Heat the olive oil in a large saute pan over medium heat. Add in the chopped onion and saute for 4-5 minutes. Sprinkle with 1 tsp of the dried sage and stir to combine. Remove from the heat and set aside. Place the cubed bread into an extra-large tray (I use something like this). Sprinkle the onion evenly over the top. Now drizzle about half of the melted Earth Balance over the top. Using your hands, stir the bread cubes around to coat, then add more as needed. Next, drizzle two cups of the broth over the top. Distribute again with your hands, then cover with aluminum foil and bake for 20-30 minutes. Remove it from the oven and stir again. Add 1 to 1 1/2 more cups of broth, stir and place back into the oven, uncovered, for 20-30 minutes more, stirring halfway through baking time. Remove from the oven, stir well, then place the foil back over the top until ready to serve. You can also make this in a large oval crockpot. Saute the onions as instructed above, then add the bread to the crockpot, two cups at a time, drizzling with vegan butter and broth so all of the pieces are well-coated. Repeat until the crockpot is filled. Cook on low for 4-6 hours, replenishing with splashes of broth here and there as needed. mmm this is the most amazing thing i have seen. my mouth is watering! Thanks Caitlin! Next to the stuffing, vegan gravy is my favorite thing at the table! I'm with you on the stuffing and gravy, I looove it, it's a shame I feel the need to wait for a holiday to make it. I may have to have a second thanksgiving dinner. I want to take this moment to thank you once again at length, especially because it is Thanksgiving after all (Well, the day after for us in Okinawa. Anyhow, I have grown so fond of your recipes as you know, to the point that I am becoming discriminant of other sites and recipes. Two times over the past week, I ventured out to try other delicious looking vegan recipes found on pinterest. Both times were epic disasters, and I would be so upset with the failed results that my husband started picking on me, "See! You should have known better than to try anything by anyone else but that lady! That's what you get for straying!" lol. Needless to say, I felt like trying something new and leaning more into vegan from my previous vegetarian holiday recipes, and I decided not to take any chances with our Thanksgiving meal- so I planned my dishes primarily on the foundation of your recipes. I ended up making the Shallot and Shiitake Wellington, this Sage Stuffing with the Shallot & Shiitake Gravy, and your Sesame Chiffon Collard Greens amongst a couple of my other vegetarian dishes and what I call a quadropalegic Turkey for my husband. Anyhow- because we live in Okinawa, not all of your ingredients are available to me. I have yet to be able to find chickpea flour or any form of seitan, which is frustrating. But I improvised on the Wellington because it looked so interesting, I just had to try it. I ended up using rice flour, and veggie crumbles to substitute the seitan- so I know it was not completely vegan. But I must say…I wanted to cry it was so beautiful! I am an artist, and this was like making art of food! Previous years I had made tofu turkey type recipes…which were mediocre but never held the same rich and satifying flavors. So I was nervous to eat this little masterpiece in fear that its taste would not live up to its aesthetics. Oh my goodness! It was so delicious! 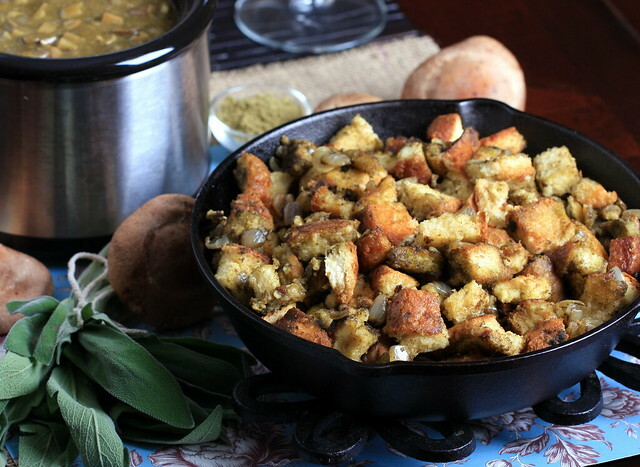 So rich and flavorful, as was the stuffing and gravy…best I have ever had…ever! This turned out to be the most satisfying holiday meal I have made since excluding meat from my diet years ago. Even my husband and son loved it all! Thank you so much for sharing all your delicious culinary creations! This has been such a blessing and made for a very special and fulfilling holiday. I really, really love stuffing too! This looks fabulous! Definitely going to make this for thanksgiving. cool! I hope you enjoy, Alex! This looks wonderful! How many servings does it make? Thank you! This makes enough for 4.